The next stop on our tour de Sioux City was Rebo’s. It is located downtown historic 4th Street amongst the bars and two blocks from the movie theater. This was another restaurant that I had never been to, but had heard many good things about it. It was a spacious building with a large bar right inside the doors. There were a lot of tables and there was also an upstairs area that tables as well. We were the only ones seated at tables, but it didn’t take long for the place to become filled during the lunch hour. It was clear that Rebo’s was a popular place for workers in the area to come during their lunch break. The sign on the wall said, “New Mexi-Caribbean Food,” and I’m not sure what that really means, but it was pretty fitting for the menu items. Our table shared a few of the appetizers and I was pleased with the different salsas, so I ordered a steak burrito that sounded pretty good to me. It took a little time for our food to come out, but that was expected for a group of 20 students. When my food came, the wait was suddenly all worth it. I was more than pleased with the portion size of my meal. 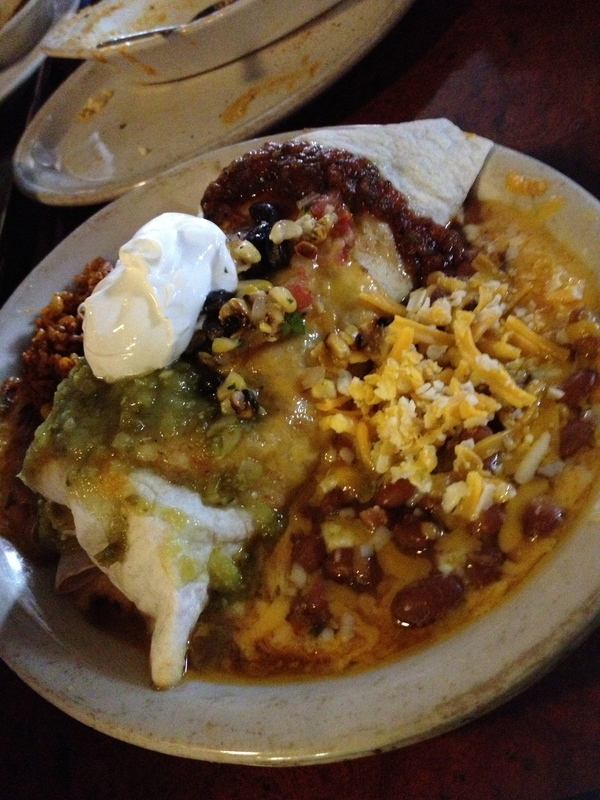 The burrito was covered in different sauces, beans, and cheeses and it was a pretty sight. I couldn’t wait to see how it tasted! It tasted just as good as I thought it would. The burrito was stuffed with a ton of food and after I spent what seemed like a long time eating it I looked up and noticed that it was only half eaten. There was some spice to this burrito as well. I’m not sure if there were any jalapeños in it or not, or maybe it was just the spice of the beans and salsa. Either way, I wasn’t complaining and I was stuffed from it, but I couldn’t resist ordering the bananas foster for dessert. 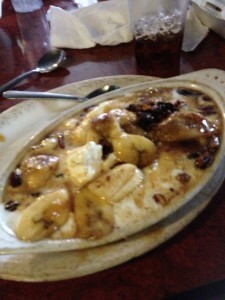 I have had bananas foster only once and I loved it, so it was time to try it again. 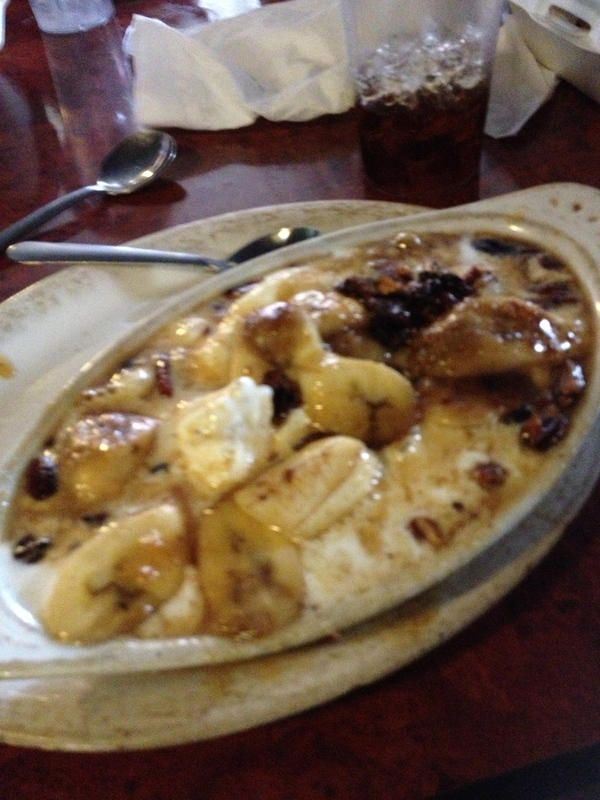 I could not have made a better decision getting the bananas foster for dessert. It was AMAZING! the bananas practically melted in my mouth with each bite and I couldn’t make myself put the spoon down until it was all eaten, which didn’t take long due to the deliciousness of it. I enjoyed Rebo’s a lot. It looked like a nice place from the outside, had a nice interior with good lighting and music, and the service was pretty good as well. Our waitress took care of us nicely and did a great job describing our options of appetizers and desserts. The quality of food was better than I expected and even though it was a little more expensive than the previous restaurants, I can see myself heading back to Rebo’s soon for at least some more of that bananas foster.